Hofstraat 11, 8400 Ostende, Belgien. 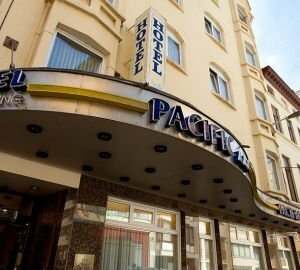 Hotel Pacific is a quiet oasis in the fascinating town by the sea: Ostend. At a pleasant stroll from the bustling streets and the sparkling nightlife of Ostend, yet only 50 yards from the beach you will find our hotel. With 53 comfortable hotelrooms, 14 with sea view and 6 with air conditioning. 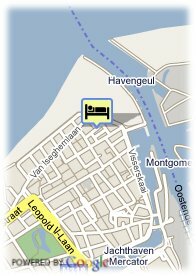 After all explorations in Ostend you can easily relax in the fitness room, sauna or solarium of our hotel and in the evening enjoy the comfortable surroundings of our friendly bar. Get away from it all ! The hotel Pacific is there for you, anytime! Bezahltes open air Parkplätze beim Hotel (15.00 €). Strand, Bahnhofsnähe, Stadtzentrum, Hafen, Museenviertel, Autobahnnähe, Flughafennähe, in der Nähe der U-Bahn / Strassenbahn, in der Nähe der Einkaufszentrum. Our hotel has a very cosy bar. Some rooms have minibar, which we fill on demand. In the summertime, we serve evening meals in our hotel restaurant.